ice storm, originally uploaded by jahansell. There was this one spot yesterday on a rise, just south of Millerton, where every tree was coated with ice. It was spectacular. Click through to Flickr to see another shot. 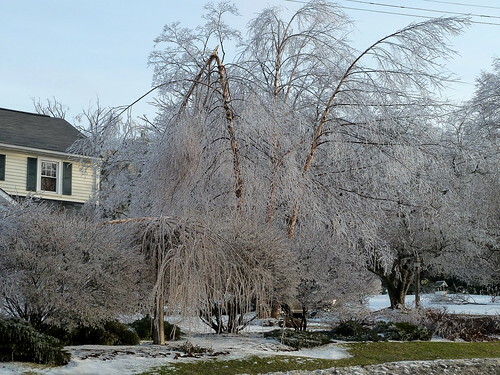 iced trees are a beautiful thing to the camera and the eye, but the damages that occur can take years to re-build/re-grow. Sharon Mt. looks much the same. Today driving out of the drive was crunchy, as the wind was blowing the ice off the trees, rather than sun melting it. The driveway was like someone had thrown diamonds on it....Rare occurrence. Nice capture Jenn.